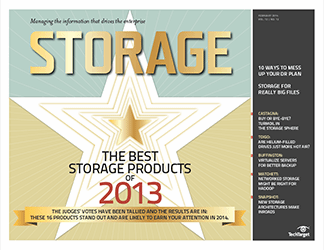 This "Sweet 16" roster of storage products represents the leading technical innovation of the past year. Don't make your DR planning process harder than it is by trying to do too much or cutting corners. Careful planning is key to a successful recovery. There are two sides to the big data story: analytics using vast numbers of small files, and dealing with storage for really big files. Our latest survey charts the storage architecture alternatives readers are using in their storage shops. Cloud closures, flash-in-the-pan solid-state vendors … storage might seem a little more dangerous these days, but it just might be innovation at work. Filling drives with helium doesn't advance the art of hard disk design, it just makes it possible to stuff more old tech into a new package.